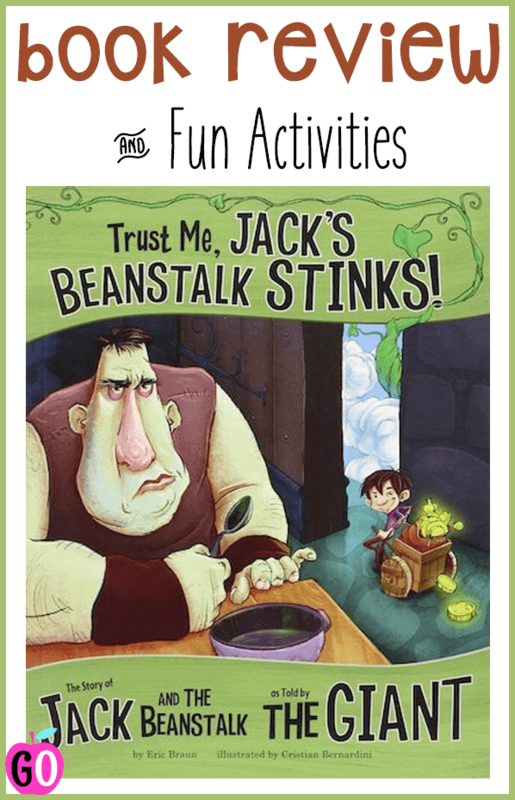 Book Review: Jack's Beanstalk Stinks! 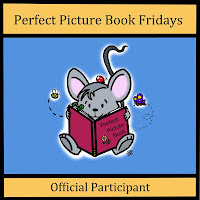 Welcome to Perfect Picture Book Friday! It's been a little while since I've linked up with Susanna and the gang, but when a child brought this book to class today, I just knew I had to share it with you. 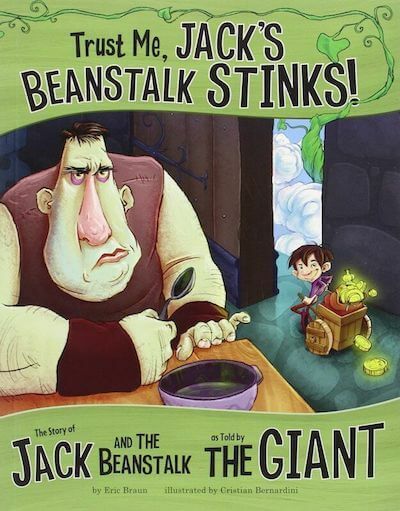 This is a funny look at the classic tale, Jack and the Beanstalk, from the giant's point of view. The giant tries very hard to garner some sympathy with his sore knees, his constant hunger and the pesky humans that keep annoying him. But hey! He EATS people and he admits it. Still, Jack DOES seem like a sneaky, mean little character. You'll have to read the book and decide for yourself. People think it's easy being a giant. You get to be rotten, grumpy, and loud. You're big and tough. You have gobs of treasure. And nobody--nobody--tells you to behave. I'm a sucker for fractured fairytales. I've read so many classics over the years that I start to get a bit tired of the goody goody heroes and heroines. And really! as the girls in my class like to say, why are the princesses always marrying guys they barely know? Yes, I digress, but my point is, it's always fun - and a good idea - to think about differing points of view. As an added bonus, I think the illustrations are gorgeous. They're big, bold and colourful. Just what I like in a read-aloud picture book. Grand Conversations ~ Immediately after reading the book, we all sat in a big circle and talked about whether or not we believed the giant. Did we feel sorry for him or was he just trying to trick us? What I love about these discussions is the kids are basically in control of them. They don't put up their hands, they just speak out when there's a space in the conversation. They were very polite today, until the conversation veered into vegetarianism and whether or not the giant is mean because he needs to maintain a healthy, balanced diet by eating kids. Hee hee. Yes, I'm a vegetarian, but I swear, I had NOTHING to do with that part of the conversation. Writing Response ~ The kids drew a picture of the giant and wrote their opinion based on our previous discussion. 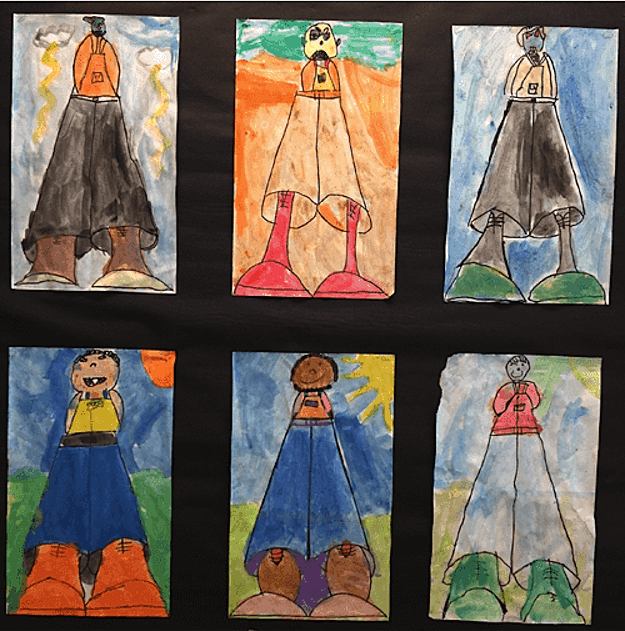 Art Activity ~ We painted these perspective drawings of the giant last week. You can find the directions right here. Please be sure to visit Susanna's blog for more perfect picture book reviews! I love fractured fairy tales, especially where the story is told from the viewpoint of Giant. What a great conversation with the children at school. Guess they don't like vegetables. And, their drawings and stories are perfect. Great activity in a classroom. Fun activity! This is a perfect story for PPBF readers. Thanks. What fun! I am a fan of fractured fairytales too and can't wait to read this one! It's pretty cute. I hope you love it as much as we did! What a great book! I love seeing things from the bad guy's perspective and think it's important for kids to learn to look at situations from different points of view. I've got to get it NOW!! Thanks for highlighting. Oh, and I love what you did with the conversation and art projects. Very cool! Thank you! I'm a fan of "grand conversations" I'm always amazed at the profound and thoughtful responses I hear from six year olds. I love fractured fairytales where the bad guy becomes the narrator and kids do too. Some of the art project giant's have some pretty cool shoes. Book sounds great! It's all about the shoes haha! I haven't heard of Picture Window Books. Looks like a fun book! They're new to me, too. They have a small series of fractured tales but I haven't read the other ones. What a perfect read to go with your perfect artwork! Yes! I've always wondered about the message of girls marrying guys they hardly know! Fun to see Jack as a sneaky little dude, and I loved learning about your students conversation and seeing their art! ive been shamelessly encouraging the girls to view the books with a feminist eye, haha! I have not heard of this one! It looks to be very funny and cute. Love the perspective drawings! Thanks, Lori. It's worth checking out, for sure! great activities! and what a fun take on an old tale.